Homeowners frequently consider custom and standard window treatments to complement windows of all shapes and sizes. While custom window blinds allow you to choose a number of appealing and unique features, standard window treatments are versatile and stylish and may prove to be more affordable than custom window blinds. Here’s how to make a choice that’s right for your home. Today, some of the most common window varieties include double hung, picture and sliding windows. Yet there is no such thing as “standard” window sizes. Home improvement manufacturers provide common window sizes designed to fit most houses, and many standard or “stocked” window treatments are available to fit these windows. Double Hung Window: Standard lengths vary from 36 to 72 inches, and standard widths extend from 24 to 48 inches. Picture Window: Standard heights range from 2 to 8 feet, and standard widths are 2, 3, 4, 5, 6 and 8 feet. Sliding Window: Standard heights are 24, 36, 48 and 60 inches, and standard widths are 36, 48, 60, 72 and 84 inches. Arched Window: These include half-moon, sunburst and other arch-shaped windows. These windows often use shades that not functioning and remain in place. Skylight: These windows are embedded right in your roof for maximum natural light. Energy-efficient blinds enable you to control the amount of light and heat that enters through a skylight window and can be customized based on the window’s location, style and other factors. Porthole: These round windows add a vintage flair to a home. 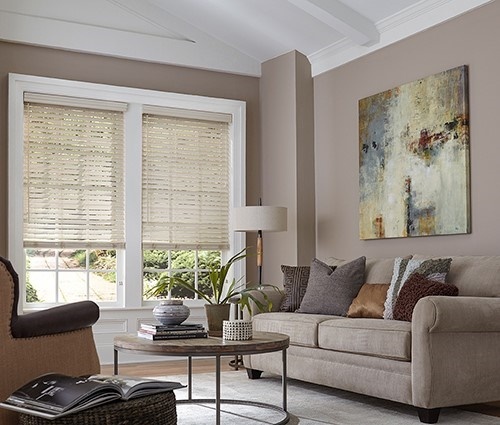 Custom cellular shades can be fixed to a porthole window; these shades will not be operable, but they can be crafted in the fabric of your choice to match your home’s décor and help filter light. Shutters are also a good choice for round window openings. Trapezoid Window: These interesting shapes add character and charm. Plantation shutters can be custom-made to fit trapezoid windows, or inoperable cellular shades may be used. Length: Standard window treatments are mass-produced, and lengths may vary up to 1 inch. Conversely, custom window treatments are individually crafted and available in a variety of lengths. Lining: Stocked window treatments frequently are unlined, while custom options feature lining that protects the treatments from sun damage and increases energy efficiency and light blocking capabilities. Width: Custom blinds can be made in custom widths that ensure they can be opened and closed with ease. Stocked blinds and shades can be cut down in store at some home improvement stores. Beyond the window size and type, here are other factors to consider before you make your final choice. Blind slats can be tilted horizontally to help you maximize the amount of light in your living space or closed to block out light. Believe it or not, the size of window slats may have far-flung effects on the overall effectiveness of your window treatments too. Standard window slat widths are ½ inch, 1 inch and 2 inches. Window treatments with wide slats are ideal for deep windows, while window treatments with narrow slats generally complement shallow windows. If you want to enhance the look and feel of a large window, choose custom window treatments with wider slats. For shallow windows, wood blinds or other window treatments with narrow slats deliver the perfect combination of quality, style and function. Inside mount window treatments are mounted inside a window frame, while outside mount window treatments are attached to a wall, on molding or outside the molding. Both mount options are available in ready-made window treatments. If you know how to measure windows for inside or outside mounts, you can determine whether the size you need is custom or standard. Check the manufacturer’s instructions to be sure to get the proper measurements. Katie Laird is the Director of Social Marketing for Blinds.com and a passionate home decorator for her family with a love of all things Mid-Century Modern and blue. Visit the Blinds.com website to find which window treatments are right for you.